December 7th, Tsuchiura city, Ibaraki prefecture. 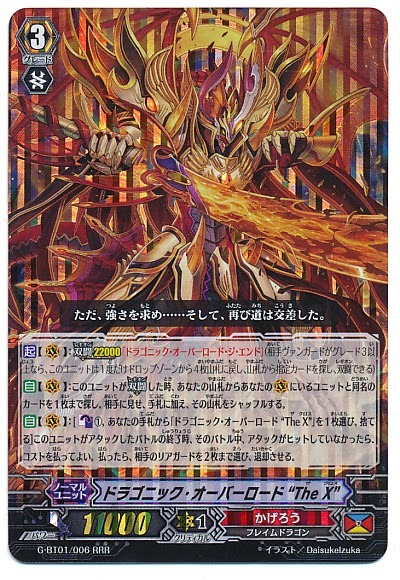 The second Vanguard Championship to take place since the Japanese release of G-BT01: Generation Stride has come to a close with Dragonic Overlord “The X” in first. The Sakura VGCS champion, alias "GmfWingal" (ごまふがる Gomafugaru, from Gomafu "speckled black") is a former Chaos Breaker and Raging Form cardfighter who had been active since December 2013, had not topped in prior Fighter's Climax or VGCS tournaments. 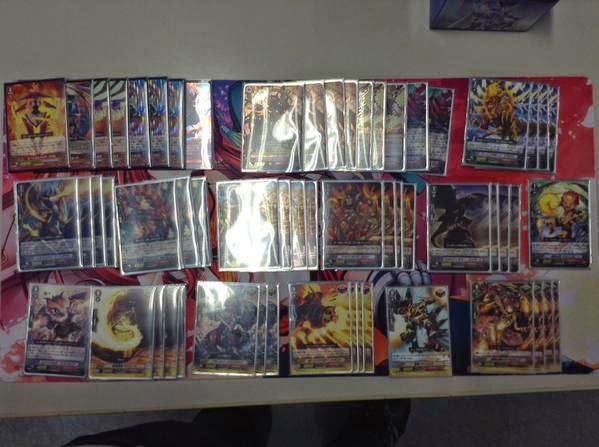 Blackgal was a native to card shop Sakura, and his decklist along with a video of the finals is presented below. The top 4 at Sakura were “The X” in both first and second place, a Seeker cardfighter in third and a Revenger fighter in fourth. Bushiroad's Fighter's Climax 2014 Nagoya stage was taking place close to the Sakura CS' start date. Tweets shortly after the event indicate that the top 4 at Nagoya was Mordred-“Abyss” in first place, Raging Form-“Abyss” in second, Alfred XIV-Thing Saver in third, and “The X” in fourth. This success of “The X” at Sakura and Nagoya has come in wake of his success at FC2014 Fukuoka, just days after the release of Generation Stride. Kagerou has been a consistent favorite for professional cardfighters throughout the game's history, due to their long-lived support across multiple formats, and just prior to the set's release “The X” was the most expensive triple rare out of the set. The primary anomaly at Sakura is the lack of visible Nova Grappler, as the fist clan to receive a restanding stride unit, Vict Plasma. Plasma's restanding ~26000 power center lane has some advantages over the contemporary “Abyss” deck, being able to swing for higher initial numbers without the setup from Mordred Phantom and being able to do so with multiple rearguard attacks as well, in exchange for being a twice per game skill. The tournament finals between GmfWingal and Mossan were recorded and uploaded to YouTube. GmfWingal demonstrated a clear difference in play style, prioritizing aggressive stride turns to change the flow of the game and following up with legion skills later on, while Mossan left his G-units untouched. Much of their early turns were spent mirroring one another, but in game 1 GmfWingal maintained a clear advantage throughout the fight by playing continual damage control and aggressively getting his opponent to higher damage. Mossan played a defensive game of minimizing his losses by continually restanding the Great and attacking GmfWingal's rearguards, using his Protect Orb Dragons to keep damage unflipped. GmfWingal instead used “The X's” on-legion skill to search out a copy of “The X” instead of the End; this gave his opponent an incentive to let the center lane hit and put Mossan further behind at 4 to 2 damage, which would make “The X's” persona blast become live on the next turn. Midway through the game GmfWingal made a critical play that is in some dispute. 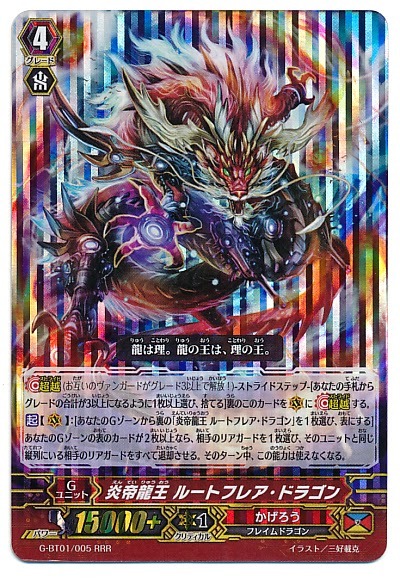 He strode Route Flare Dragon and used its skill to turn a copy of it face-up in the generation zone, but because he did not have two face-up G units after doing so, he could not retire a column. Route Flares skills states "This ability cannot be used for the rest of the turn." but because not being able to use the ability for the rest of the turn was believed to follow from having two or more face up generation units, and it did not satisfy the condition of "If the number of face up cards in your G Zone is two or more," the remainder of the skill, including the statement that it could not be used for the rest of the turn was not implemented. 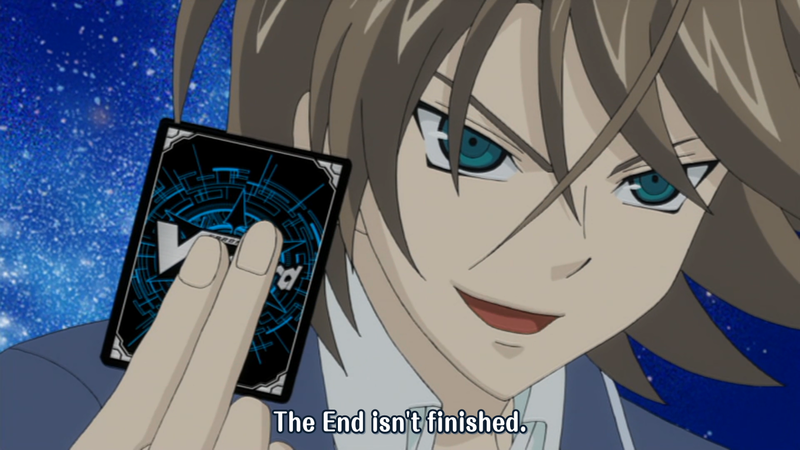 A later ruling issued by Bushiroad Inc.'s support staff stated that based on as much of the skill text needing to be fulfilled as possible, "This ability cannot be used for the rest of the turn." should have taken effect. Gmfwingal issued an apology for the mistake over Twitter. GmfWingal ultimately won game 1 by deck out, reaching the point where Mossan had no critical triggers left in his deck, no-guarding his vanguard while at 4 damage, and then passing his turn so that Mossan would draw his last card and automatically lose. This type of game is only possible with the extended time limit that VGCS tournaments afford; in Bushiroad's system both players would have hit time at the 20 minute mark and mutually lose, producing a tournament with no winner. In game 2, GmfWingal started at a clearer disadvantage and played more carefully to stride from the outset with Divine Dragon Knight Mahmoud, but forgot to use his on-hit skill to retire Mossan's Calamity Tower Wyvern. Mossan was able to get a stronger early game going, but multiple turns of stride shifted the pace of the fight in GmfWingal's favor; by striding Route Flare on his next turn and using his persona generation skill to retire Dragonic Overlord the Great, then using the copy of Great he discarded for stride for Burnout's skill to retire Calamity Tower, and attack Burning Horn with Burnout afterwards, GmfWingal cleared out his opponent's rearguards and set up a net four card advantage over Mossan. In both of these games any attacks on the rearguards by “The X” were effectively unblockable because Protect Orb Dragon cannot guard for a rearguard; nevertheless, versus a 29000-power “The X” lane, GmfWingal chose to put down 30000 shield to prevent the End's persona blast from going off, trading card advantage to shut down Mossan's recovery gameplan. Without a definitive way for Mossan to overtake the match, GmfWingal won the finals 2-0. Original image uploaded by Card Shop Sakura. GmfWingal's decklist was similar in composition to that used by Bottan at the Nagoya tournament, including nearly identical grade 3 lineups, choice of stride units and grade 2 lineup. The primary difference between them is that GmfWingal favored Burning Horn Dragon over Neoflame in the rearguard, and their aesthetic choices over trigger units.